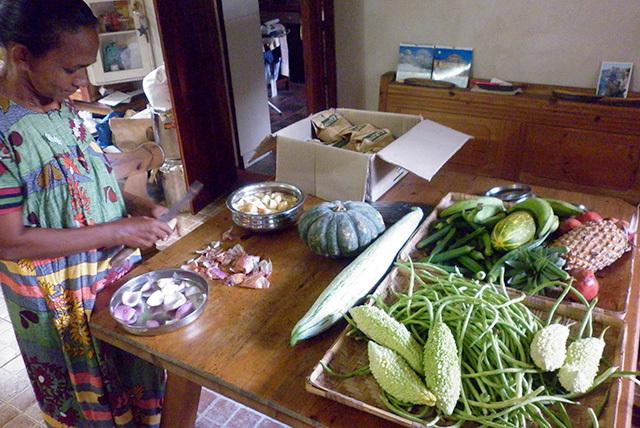 Leelamma preparing lunch for the day with vegetables grown using organic manure from Kanjikuzhy Cooperative Society during the 45th Wellbeing Tibetan Medical Camp organised by Friends of Tibet and Men-Tsee-Khang at Centre for Social & Political Art (CSPA), Sylviander House, Alappuzha. The other day, it was very disturbing to see seven people affected by Cancer and six people affected by Chronic Kidney Disease. What was more disturbing is the fact that this many people consulted within two hours - between 11am and 1pm. Cancer is now an 'epidemic', better declare it as one! One interesting conversation regarding today's lifestyle, excessive aggressiveness, impatience, hyper reactive behaviour brought around the discussion about how the food we consume affects one's behaviour and health. It's sad to see the drastic change in the food habit of ours in the last decade or so; from steamed healthy food to '2-minute disasters' and pesticide injected fruits and vegetables. Whom do we blame! We are in love with the blame game, we are helpless, what can we do? We complain the low quality of food produce; we complain the drop in hygiene; pollution and about plastic strewn in the streets and drainage. Usage is in our hands! The choice is ours, whether to use or not, whether to buy or not, why we do not think before we buy, rather than giving in to impulsive purchases? Choice is ours. The last four years Wellbeing Tibetan Medical Camps evolved. One of the major milestones is promoting the 'Paper is Prettier' Campaign of Design & People, dissuading the usage of plastic in any form. The next natural step was to promote organic living. This year the camp location was shifted to Center for Social and Political Art (CSPA), located at the eco-friendly Sylviander House and Museum at Alappuzha, Kerala. Along with fresh non-polluted air, we started preparing ourselves for an organic appetite. Wellbeing starts with us, the organisers and hosts, so that we practise what we preach! 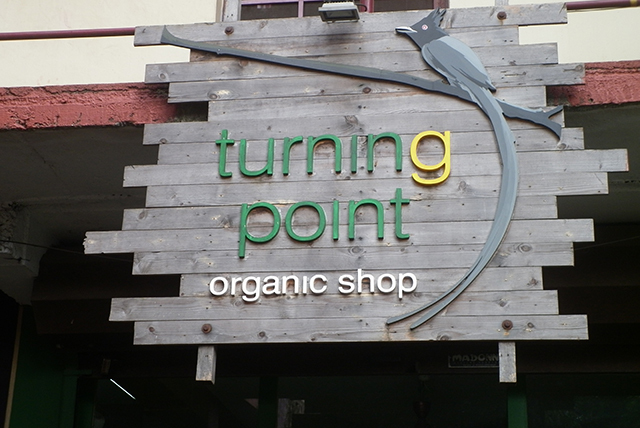 A day before the camp, our journey starts from 'Turning Point', a shop selling organic food produce, located at Palarivattom, Kochi. This is where we purchase the rice to be cooked for the team from Men-Tsee-Khang, Bangalore, the Friends of Tibet Volunteers who conduct the Wellbeing Camp. Rice neatly packed in eco-friendly package extends our 'Say No To Plastics' campaign. Turning Point was indeed a turning point in the life of the owner of the shop, KN Shaji. A couple of years back, Shaji a renowned columnist and film critic, was affected by lifestyle-related disease that put him down and made him re-think. The disease made a change in his life, from unhealthy lifestyle to an organic life promoter! Ever since, he encourages the people of Kochi to lead a healthy life by consuming organic food produce. Books on the subject and Organic food items welcome us at the shop. Our next stop is at Kanjikuzhi Co-operative Society along the National Highway en route Alappuzha. Fresh vegetables grown using organic manure smile at us. The next twenty minutes is spent selecting the wide range of vegetables for the three day camp. It brings us immense happiness to carry the produce to Center for Social and Political Arts (CSPA) located at Sylviander House and Museum where our journey concludes. A mark of satisfaction to see the vegetables being neatly sorted to be cooked by Leelamma our cook during the camp days guided by Alexander and Sylvie the hosts and campaigners for the cause. Wellbeing is a way of life. Wellbeing is about healthy living! This report is prepared by by Eswar Anandan, poet and 'Friends of Tibet' Campaigner based in Kochi. He can be reached at eswar.anandan@friendsoftibet.org.